Rotisserie chicken, with crackling skin and tender meat, is one of the best things you can cook on your grill. Now, rotisserie chicken is a little extra work - the bird has to be trussed into a tight package and secured on the rotisserie spit - but a great chicken it is worth the effort. Trussing a chicken is a little tricky. There are wings, legs, and drumsticks sticking out everywhere, and they need to be locked down. Flopping wings and wobbly legs will pull the bird loose from the spit forks as the meat cooks and tenderizes. Oh, and one trick to tying the knots when trussing - use a double loop to start the knot. This adds extra tension when you pull tight, and holds the first tie in place while you complete the second tie to finish the knot. 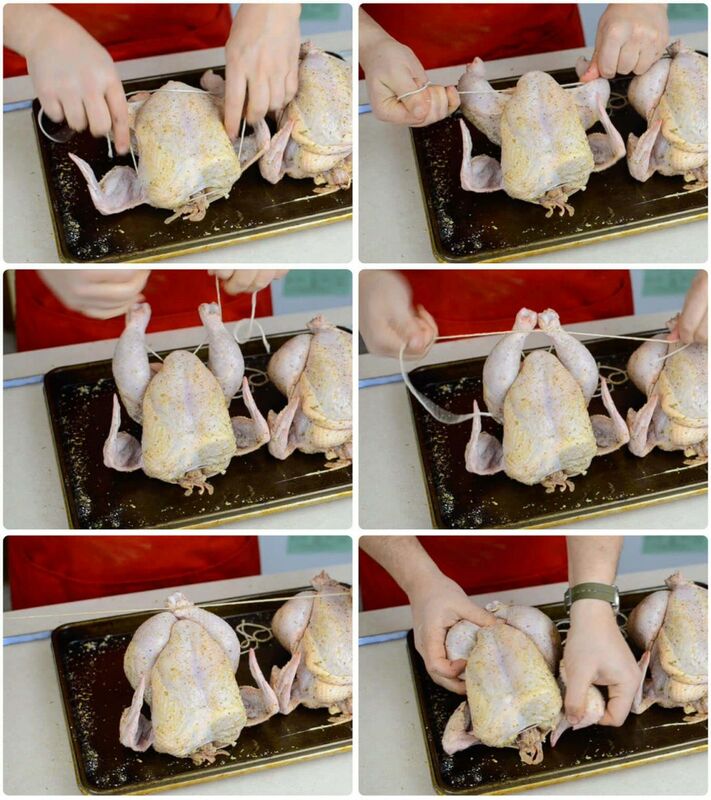 Note: I’m using chicken as my example, but this trussing technique works on all types of poultry, from the smallest Cornish hen up to the largest turkey. The only difference is size. Cut a piece of twine four times the length of the bird. Fold the wingtips tight under the bird; this locks them in place, so they won’t flop around on the grill. Set the bird on its backbone, with the drumsticks pointing at you and the breast and wings away from you. Find the middle of the piece of twine, reach around to the front of the bird, and loop that middle over the nub of the neck. Wrap both sides of the twine around the breast, just above the wing, and bring them together at the cavity behind the bird. Tie a knot at the cavity - remember, start the knot with a double loop - and pull the knot tight to plump up the breast. Next, tie the drumsticks. Take the ends of the twine in both hands and bring them down between the knobs of the drumsticks. Loop them out and up to catch the knobs, then pull the knobs of the drumsticks together by tying the double loop and pulling tight. Keep tightening the knot and pushing on the knobs until they cross, forming an X. Continue to tighten the knot and push the knobs towards the cavity until the drumsticks are up against the first knot. Finish off the knot and trim any extra twine. Tighten the first spit fork on the spit. Run the spit through the bird, starting at the cavity in the back, and sink the forks into the thighs. Slide the second spit fork on to the spit and push the fork into the bird’s breast meat just above the wings. Keep pushing until the bird is squeezed between both forks. 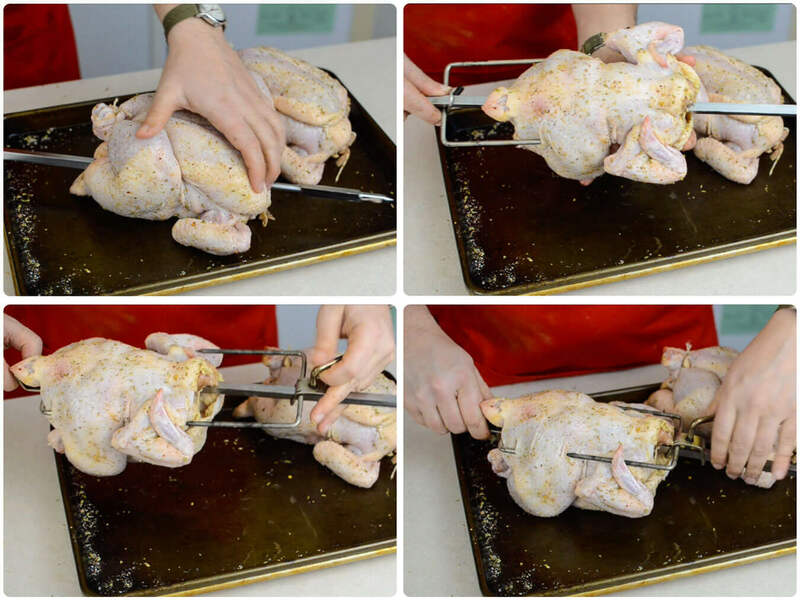 Make sure the bird is centered on the spit, then tighten the second fork to lock the bird in place. That’s it - the bird is ready for the rotisserie.